My recent debut solo gallery show Normalisation of Deviance at Pump House Gallery London contained many works available for purchase. 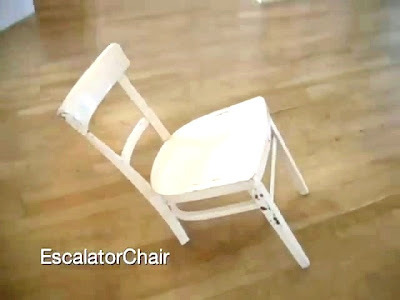 EscalatorChair is an functionless art object, unless placed upon an escalator, at which point it becomes a practical piece of furniture. Each EscalatorChair comes with a dvd of Richard Dedomenici riding it on the nearest escalator to where you live. Available for £1000 including delivery. 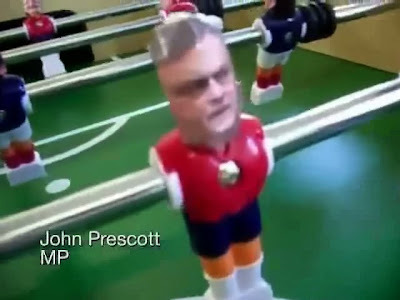 Following the success of my Political Top Trumps card game, I present a new solution to the problem voter apathy amongst young people - modifying the players of a football table to resemble members of parliament. 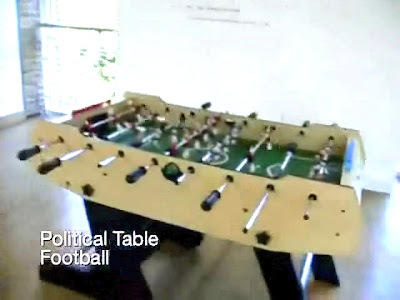 It is envisaged that Political Table Football could also be used by MP's to settle minor political disputes, thereby speeding up the legislative process. Available for £1500 plus shipping costs. People that have donated bands to the sphere so far will get a proportionate cut of the price in the event of a sale. 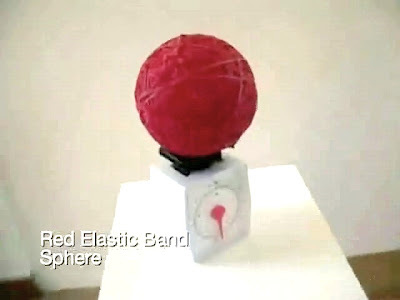 I am willing to sell Red Elastic Band Sphere at a cost of £1 a band, which currently puts the price of the work at £2557 (includes weighing machine). Postscript: The Thessaloniki Seven were released the day after my letter arrived at the Greek Embassy. PlateSmasher comes complete with 120 unglazed plates ans also includes microphone and leads to attach to amplification system (not included). PlateSmasher is fully refrigerated and includes an internal fluorescent lighting system. Dimensions: Width: 74cm x Depth: 87cm x Height: 183cm. PlateSmasher generated revenues of over £50 during it's installation at Pump House Gallery. At this rate the work could be profit making within four years, given PlateSmasher's selling price of £2000 including delivery.